On Saturday, Hong Kong celebrated the start of the Year of the Goat. But since it was returned to China in 1997, it has been struggling to find its own identity. Hong Kong's Botanical gardens are one of the most pleasant parts of the city centre, a lush, peaceful place, with great views of the skyscrapers. But this is also a battleground, between the city's colonial past and its Chinese future. A recent plan to move a statue of Britain's King George VI and place it next to some nearby monkey cages caused an uproar. Patrick Hase is the chairman of the Royal Asiatic Society. "This is an attempt to belittle and downgrade the British side of the history of Hong Kong. Now Hong Kong has to develop a new history, new community, a new way forward, but you do that by building, not demolishing, " he said. The plan was to replace King George with a statue of China's first President, Sun Yat Sen. It touched on the central dilemma facing Hong Kong- how the city redefines itself now it is part of China. In Hong Kong everything got to be quick, quick, quick, fast, fast, fast, you can never stop, you can never sleep, you just have to keep going and going. 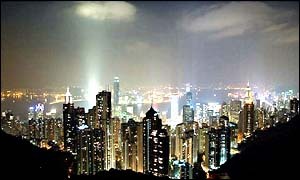 Hong Kong is still a mercantile, money-making town. Its recent fashion week in the ultra-modern harbour-front Convention Centre drew thousands from around the world. John Chang, a local designer, is a typical young Hong Konger, educated abroad, back to make his fortune in China's most international city. "I'm not the only one. There are so many people who have been studying, or have moved to some other places and who are now back in Hong Kong to explore their careers," he said. Hong Kong has always been a sort of rootless refugee city. Waves of immigrants from mainland China continue to arrive, along with Westerners, Asians and overseas Chinese coming home. It has been the source of the city's energy, but also its insecurity. John Chang explained: "what I do for one day is what I used to do for 3 days in Australia. I mean the pace is very different, in Hong Kong everything got to be quick, quick, quick, fast, fast, fast, you can never stop, you can never sleep, you just have to keep going and going." But since the handover the spring has gone from Hong Kong's step. There have been two recessions, the property and share markets have collapsed. Tom Hilditch, the social diarist for the South China Morning Post newspaper, says the city is facing a crisis of confidence. "We used to define ourselves through shopping and consuming... everything we touched turned to gold, we would buy three flats at a time. Now a lot of that consumerist past-time isn't working out, so people don't have any money and they sit at home wondering what to do, " he said. Since its return to China, Tom Hilditch says Hong Kong has lost something of its special role and found nothing to replace it. "I think Hong Kong is trying to find itself. It is neither part of the mainland, nor is it part of the British Empire. It's this rock floating between two worlds, and people who live on it are trying to decide where they belong," he said. Christine Loh, who runs a local think-tank, says the sense of self-doubt is fuelled by the fact China's other cities like Shanghai and Beijing appear to be dynamic, booming places, confident the tide of the times is running in their favour. "When you used to be the most modern city, the richest city in China, and then all these cities seem to be catching up, you think oh maybe I'm not as good as I was. Now we're plugged right into a very big country, we're really lost. We don't know that big country very well, they don't know how we work, and we're eyeballing each other," she said. Hong Kong is moving to integrate itself far more with mainland China. But Patrick Hase, says it remains a place apart. "The border is still very, very much in place. It wouldn't be unfair to say that having been a British colony for 150 years we're now a Chinese colony. Because the way Beijing runs Hong Kong is not wildly dissimilar to the way London did in the past," he said. Compared to mainland Chinese cities, Hong Kong is still far richer, far freer, and far more developed. But the move from colonial to Chinese rule has proved a wrenching experience, a psychological rupture that could take years to resolve.